Hi All- I had some computer problems last night, and wasn't able to post the answer to the plant quiz like I had promised. Would you believe that the yellow shrub is actually a pine tree? It is tamarack, Larix laricina. Usually, they are tree-like, but this one was behaving as a shrub. The stringy shrub in the picture is leatherleaf. Both of these species are potentially threatened in Ohio. The best place to see them is in the bogs of Northeast Ohio, like Triangle Lake and Kent bog. Also, the red stuff? It is a species of sphagnum moss that is quite attractive. I've seen reddish sphagnum at Kent and Triangle, but at little pond, it dominates certain areas, and as Lana said, this scene was almost completely void of any blue or green tones, just reds and yellows. Here's another plant shot from the bog and little pond, and I hope this one is more familiar to everyone. Any guesses? This photo is shot with an extreme wide angle lens that I rented for our trip to Maine. I decided on the Canon EFS 10-22 from Lensrentals.com, and what fun I had with it. Although landscapes are what you typically think of when thinking wide angle photography, I tried taking closeup up shots of various subjects, including this scene of the Sphagnum moss and today's mystery plant. I did enjoy this post and answer. I also looked up the lens rental place and checked out some of them for future use. A lady from Columbus who I met at Aullwood farm rents a lot of her camera things there and goes another place and buys used cameras. She had a van and the back was full of high end cameras she got there plus lenses. 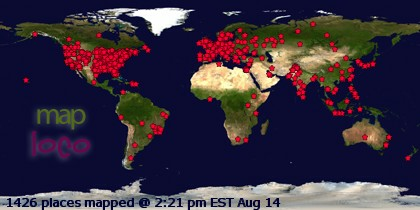 I never saw so many. Lol! Abe, that is hilarious. I wonder who it is. There are a ton of photogs around c-bus. Pretty much everywhere I go, I always see people armed with cameras. I haven't been to Aullwood in a long time, but I remember being incredibly impressed by their nature center when I visited back in 2001 during my time living at Oxford. Looks like the beginnings of some cranberry jelly to me! 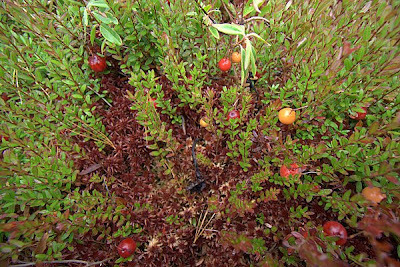 It's funny, we never knew there were cranberries in the bog until you started exploring.